Fair Trade Cafe started with a dream, to bring direct and fair trade, organic coffee to the Downtown Phoenix Art District and to the Downtown Core. This dream resulted in Fair Trade Cafe, conveniently located downtown, directly off the Phoenix light rail and with access to the new bike share program. Emerging, local artists - Fair Trade accepts portfolios of emerging, local artists and takes only a low percentage for work that sells. First Friday's - First Fridays have Fair Trade as a regular stop, where hundreds may come through in that one night. 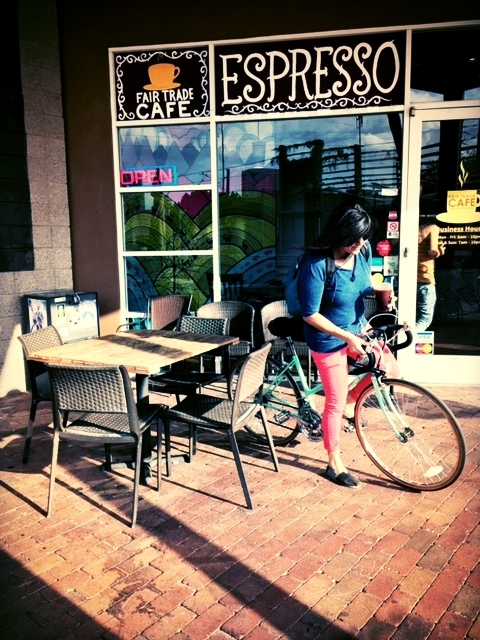 Bikable- Explore the Downtown Phoenix Art District! Grid Bike Share - Grab a bike from the GRID Bike share directly across the street. Right off the Light Rail Line - Just exit at the Roosevelt stop! In-House Bakery - All of our pastries are made in-house! Full menu to choose from - Check out our menu here. Courier Service through Bike Force- Need your coffee and food delivered? We offer a bike courier service, call for more details! Did we say ice cream? Fair Trade offers artisan, hand crafted ice cream. Fair Trade and Direct Trade Coffees - Get a coffee for here, to-go or buy some whole bean coffee from us. We can grind it according to any of your preferences! Poetry Nights - Check our social media content for upcoming poetry nights. Outdoor Seating - Come enjoy our shaded outdoor patio, but grab a seat fast as they are always favorite seating! Group Accommodations - We can accommodate any of your group needs such as reserving large tables or table service. Various Groups - Come check out our flyer wall for all the downtown happenings.